On June 2, people across the country will wear orange to honor all those who have been killed -- and inspire action to stop the gun violence that takes too many lives in America. Why orange? It's a color that symbolizes the value of human life. Hunters wear orange to alert other hunters that they're there -- as a way to take care of their own life and the lives of others. Now, we're turning orange into a symbol for the value of human life everywhere. Fill out your information on this page to take the pledge, and you'll get a reminder to wear orange before June 2. 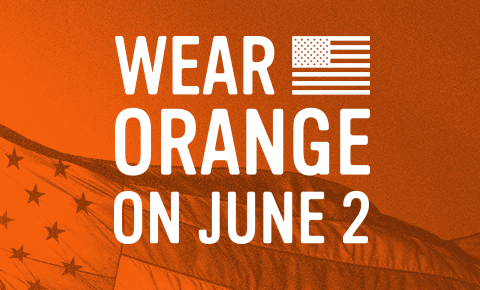 By wearing orange on June 2 (National Gun Violence Awareness Day), we reaffirm the right of every American to live a life free from gun violence. **We will send you email updates about this and similar campaigns. ***Msg & Data Rates May Apply. Reply STOP to opt out. EVERYTOWN, the EVERYTOWN FOR GUN SAFETY logo, and the flag design are trademarks or registered trademarks of Everytown for Gun Safety Action Fund, Inc.
deborah d. just signed the Pledge to Wear Orange on June 2 petition. Denise K. just signed the Pledge to Wear Orange on June 2 petition. Karen L. just signed the Pledge to Wear Orange on June 2 petition. Diane O. just signed the Pledge to Wear Orange on June 2 petition. Darlene S. T. just signed the Pledge to Wear Orange on June 2 petition.